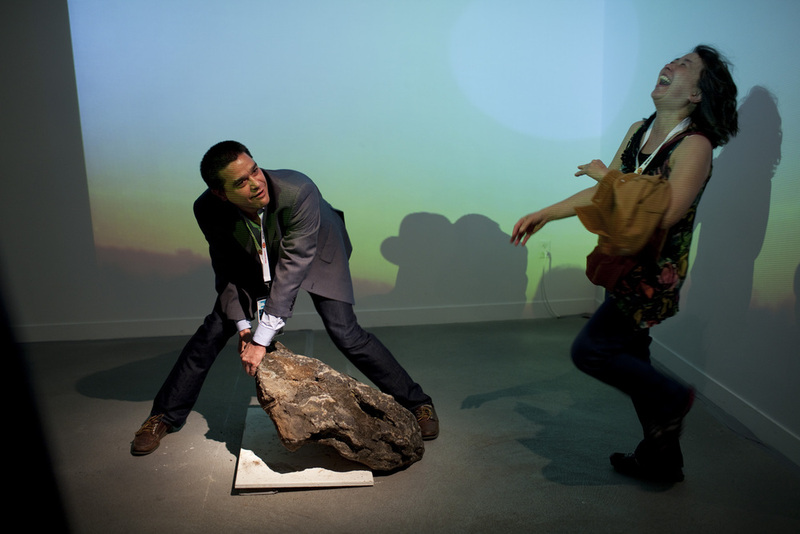 KinoTek programmer Sean Uyehara enjoys part of Karolina Sobecka's installation, Human Moves, Animal Visions. Photo by Pamela Gentile. SFFS Kinotek: Ways, Points and Means, installation by Adriane Colburn at Superfrog Gallery, June 22–July 7, 2012. Photo by Hilary Hart. Viewers donned special wooden glasses with polarized lens to watch Brent Green’s new work To Many Men Strange Fates are Given on exhibit at Stephen Wolf Fine Arts as part of the Film Society’s KinoTek series. From left Bill Proctor (SFFS), Karl Cohen (ASIFA-SF) and Keith Cowling (SFFS). Photo by Hilary Hart. There is the description of the thing and then there is the thing itself. It’s difficult to write about the KinoTek programming stream without making it sound extra stuffy, alienating and art-world-y. That’s partly because KinoTek was established in 2006 by SFFS to engage, investigate and present the array of increasingly hybridized modes of media production, distribution and exhibition. The programming stream always incorporates moving image media and has presented live cinema, machinima, dance performance, theater, parametric and computational art and live music and film. Lots of seemingly heady nerd potential. And, in truth, the majority of work out there that capitalizes on changes or combinations in technological and mediated platforms is (not surprisingly) soulless. But, I’ve worked hard to find and present work that is rigorous, provocative and engaging. Not all of it is for everyone. But, (hopefully) every project is for someone. And, who knows, maybe that someone is you. This week, SFFS will present the final installment of a special series of eight KinoTek programs. This special series began in 2011 with a focus on artist Laurel Nakadate and also featured Nate Boyce, Brent Green, Adriane Colburn, Erin Markey, Karolina Sobecka and Marius Watz. We saw the presentations of musical theater, 3-D and laser printed objects, a walking video tour, multi-plane animation projection, feature length film, photography, cut paper works, storefront projection, hacked LCD screens and interactive computer interfaces including a treadmill, a mirror and a 300-lb volcanic rock. For the special programming arc encompassing 2011–12, SFFS also commissioned original written articles to accompany work presented aiming to widen the reach of the artistic programs and also to increase access the ideas embodied by them. We have presented new writing by Mary Gaitskill, Bruce Sterling, Michelle Tea, Akira Lippit, Jordan Cantor, Kenneth Goldsmith and with more to come. The series ends on December 12 with presentation of a new animation by Kota Ezawa and reading by Kenneth Goldsmith. Both Ezawa and Goldsmith confront the traditional notions of creativity and authorship, as they present works that are essentially transcripts of other events. What’s difficult to communicate in that is how engaging, funny and uncanny their work is. Each has a knack of displaying what’s at stake in a moment—one of Ezawa’s famous pieces has to do with the OJ Simpson trial verdict and Goldsmith is currently completing a series of transcript works on American tragedies such as the Kennedy assassination – and then reveals how the world just continues to pass us by even with those stakes attached. There is the description of the thing and then there is the thing itself. And, it’s in that rub that the world is produced. You should come on Wednesday, December 12 at Kadist. It’s free and open to the public. 7pm.